As a replicant, or "technohuman", Detective Bruna Husky knows two things: humans bioengineered her to perform dangerous, undesirable tasks, and she has just 10 years on the United States of Earth before her body automatically self-destructs. But with "antitechno" rage on the rise and a rash of premature deaths striking her fellow replicants, she may have even less time than she thought. Investigating the mysterious deaths, Bruna delves into the fractious, violent history shared by humans and replicants, and struggles to engage the society that fails to understand her - yet created her. The deeper she gets, the deadlier her work becomes as she uncovers a vast, terrifying conspiracy bent on changing the very course of the world. But even as the darkness of her reality closes in, Bruna clings fiercely to life. ©2012 Rosa Montero (P)2012 Brilliance Audio, Inc. 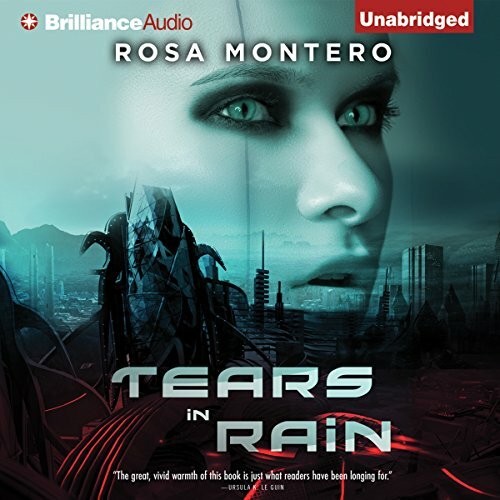 If you could sum up Tears in Rain in three words, what would they be? The technology of techno 's and the T.P. parts. She's. Vary talented women keeping up with this book you have to be openly in a zone .She pulls this off and that's not faked. It's magic together. Yes the struggles within to cope with discrimination. Of one whom longs to be excepted. If you like techno thriller's? Get it. anyone who's a fan of blade runner should consider this book, it's not as good obviously but it is still a good story that can be enjoyed as a sci-fi fan. some of the chapters repeat. the narrator is very good. the theme is well throughout. This audio book was very interesting and fast paced and all the characters were dynamic, interesting, and fun. The narration was great Hope some day there will be a book 2. Would you listen to Tears in Rain again? Why? The main character, Bruna Husky. She was complicated, flawed, smart and interesting. No, I had never heard her before. This was an good performance.